Until 1960, this was the Antigua Casa de los Condes de Santiago Calimaya. Though renovated in 1778, the building was erected in 1536 and was one of the first houses built after the Conquest. An exotic bit of supporting evidence comes from the recycled Aztec sculpture of a serpent's head at the black base of the corner shown here. The land had been granted by Cortés to Juan Gutierrez Altamirano, one of whose descendants in 1616 gained from Philip II the title of Count of Santiago de Calimaya. With the decline of the family's fortunre, the building became a market, then a tenement before finally being sold to the city in 1960. 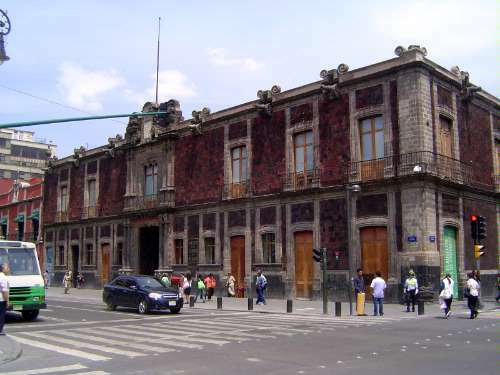 Since 1964 it has housed the Museo de la Ciudad de Mexico.